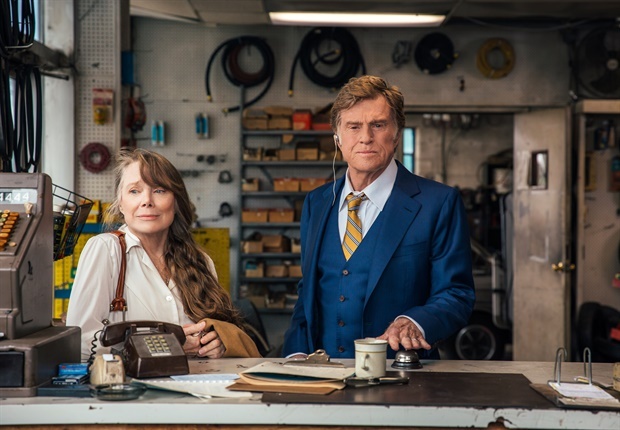 Stars: Robert Redford, Sissy Spacek, Casey Affleck, Danny Glover, Tom Waits, Tika Sumpter, John David Washington, Isiah Whitlock jr.
Redford plays Forrest Tucker, a real-life spry and charming septuagenarian serial bank robber and prison escapee who embarks on a multi-state bank robbing spree. The film was inspired by an article written by David Grann (author of The Lost City Of Z, etc) that appeared in the New Yorker in 2003. Redford brings plenty of charm, charisma to the role, and he brings that familiar twinkle in his eye to his role as the lovable rogue, a staple of his lengthy career from Butch Cassidy And The Sundance Kid and The Sting. Although he robs banks, Tucker has a gentlemanly demeanour as he pursues his profession with little violence, charming bank tellers in several different states with his manners. His “Over The Hill” gang consists of two accomplices – Teddy (played by Danny Glover, who is given little to do) and Waller (singer Tom Waits). Tucker’s nonviolent crime wave captures the public’s imagination and he becomes something of a folk hero. While evading the police after his last robbery Forrest meets Jewel (Oscar winner Sissy Spacek, from Badlands, etc), whose car has broken down on the side of the road. He helps her out and thus begins a relationship between the bank robber and the kind-hearted widow who runs a horse farm. Jewel loves Forrest in spite of his profession and it is late life romance between the pair that brings a bit of heart to the material. On Forrest’s trail is cynical rookie Texan detective John Hunt (Casey Affleck), who has been worn down by the drudgery of his job as a policeman. Hunt is determined to put Tucker behind bars, and he builds up a detailed picture of Tucker through trawling through boxes of documents and records and conducting lots of interviews. But he gradually develops a grudging admiration for his wily nemesis. There is one fine and quite funny scene in which Tucker meets Hunt in the bathroom of a café in which they exchange ironic pleasantries. The Old Man And The Gun is a lightweight affair laden with plenty of references to Redford’s film career, especially his golden era of his 60s and 70s heyday – indeed, a montage depicting his daring escapes from prison draws scenes from his 1966 film The Chase, which was directed by Arthur Penn. Redford also brings a self-deprecating sense of humour to his role. Both Redford and Spacek bring years of their own filmography to the material. Redford oozes charm and delivers a playful and incorrigible performance that carries the baggage of many of his previous likeable cinematic rogues. Spacek delivers a measured and empathetic performance. The two share a nice rapport and chemistry. Affleck’s role here is a familiar one but he does deliver a solid performance. The director is David Lowery (Ain’t Them Bodies Saints, etc), who makes a welcome return to his Texan noir genre after the disappointment of his previous film the meditative and dull A Ghost Story, a meditative study of grief and loss which essentially saw Affleck hidden by a bed sheet to play a ghost. Redford previously worked with Lowery on the live action remake of Pete’s Dragon, and he knows how to use Redford’s star power to good advantage. Lowery directs at a leisurely pace that perfectly suits the material and his approach is largely unsentimental. The film has been atmospherically shot on 16mm and deliberately grainy film stock by cinematographer Joe Anderson (Don’t Think Twice, etc) and it captures an authentic 80s vibe. Cars and costumes and settings all reek of authenticity. The Old Man And The Gun is more interested in propagating a mythology of a wonderful character and a forgotten America rather than the absolute truth of the story. And while Redford doesn’t go out with a bang like Eastwood or John Wayne, this makes a fine last hurrah for a screen legend.